welded quite a few times, not sure why. Barr makes a cast iron reducer for 3" to 2 1/2"
racing runabout replicas powered with new mercruisers that are left hand and had no issues. Just dock to starboard. That was my boat, Kings Transom. Panel was done by Pat Powell who has passed on. 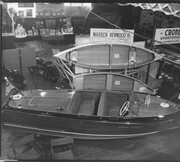 Have two keels here from 1946 17' deluxes. Both measure the same from the transom on bottom side. 24 3/4" back end of hole, 28 5/8" to front end of shaft hole. I'm coming to your shop to get wood. Never received my brass bell either. mixed with water, leaves no glue line. Time for a new boat buzz header photo. Topic: Sportsman hull plate location? Should be mounted on the inside of engine box. debellajeepparts.com has a 6 volt horn. through by hand first. Just might have a burr. Got both of mine a week ago along with 5" of snow. You can also get the flooring at Defender Marine. Here's the spring packs of a 1946 17' deluxe.